Last Quarter our Pig Catching process dealt with the question: ‘How can Africa become a global economic player? Janet du Preez from Tools of Greatness, facilitated the process and did a masterful job of blending her own work on employee engagement with the SNE methodology she learned from Playing Mantis. 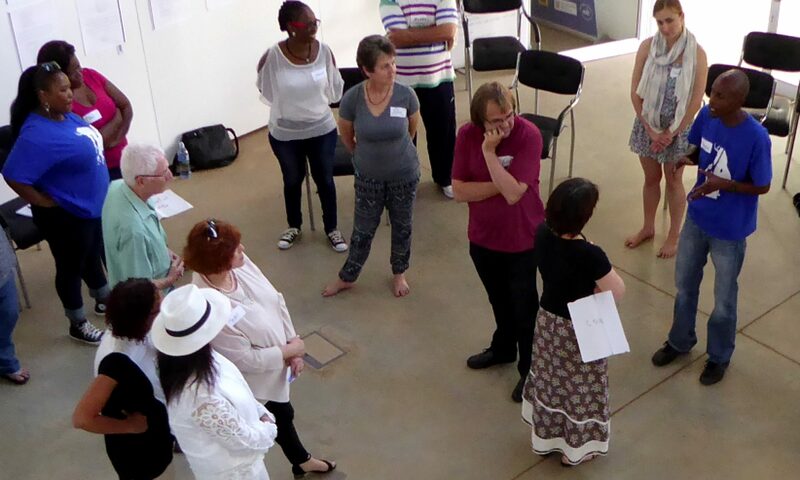 In the group was a mixture of organisation development practitioners and applied drama facilitators and both groups were mesmerized by the process. One of the applied d drama facilitators was deeply intrigued by Janet’s innovative use of well known processes. I will tell you of two such memorable moments here. Janet used the very well known applied improvisation game in a very strategic manner. The game is sometimes called ‘Props’ and sometimes ‘This is not a water bottle /stick etc.’ Usually the game starts with a group standing in a circle with a single object in the centre, or sometimes a small number of different objects in the centre to choose from. Participants then take up the object (e.g. a water bottle) a and say ‘This is not a water bottle, it is a…’ and then they name something else e.g. a cell phone while at the same time using the water bottle as though it is a phone. Instead of either placing one object in the middle of the circle for all to use, or placing a number of different objects to choose from, she gave everyone the same object, a stick of about two feet long. Secondly, she did not require us to stand, but allowed us to stay seated in our circle. Finally, instead of using the game as it often is just to warm up people’s brains and let them randomly come up with things the stick could be, she gave it a particular strategic frame in keeping with the principle of strategic intent as incorporated in the SNE (Strategic Narrative Embodiment) methodology. We were to use the stick in the first part of the workshop as a way to name all the things that stand in the way of Africa’s economic flourishing. In the second part of the workshop we did the same exercise and used it to brain storm a picture of the ideal Africa. At the end of each round she asked the group to consolidate and integrate the ideas into a single representation by making tableaux – image with their bodies. In between the two rounds Janet did a number of other exercises to lend depth to the conversation. Reflecting on the exercise, participants experienced elevated levels of creativity coupled with increased levels of safety. Sitting down instead of standing up and being able to hold on to their stick throughout the exercise removed a sense of perpetual vulnerability that they often associate with this exercise. Layering it with the strategic frame and integrating it into a larger design with tableaus and other processes, contributed depth and meaning to the experience. It is a common practice to let participants build a real image, then an ideal image and then to transition them from a real to an ideal image using wome kind of process Boal style. My experience is that the practitioner usually chooses to work either with group images, or individual images. Janet used a combination of both in a startling manner. To transition the thinking from current obstacles to future ideal image, Janet used the SNE technique called ‘Moving Story structure’. The process is a rather involved technique where the individual moves through a series of individual images that include ones that express our default reactions to obstacles and our defense reactions as well as idealised responses that are not practical etc. The end result is a clear understanding of what is real and practical actions we can take right now to get unstuck and closer to where we want to go. While this is originally an individual embodiment process, Janet combined the individual work with group work so that we each had a clear experiential knowledge of how we each contribute either to the success or failure of the collective endeavour. If you take in the fact that the group of people in the room were diverse and representative of various demographic groups of people in our country, such an experience was nothing less than moving and hopeful. Each of us left with a clear understanding of how we may be hindering collective flourishing and what we may be able to do as individuals to move into a thriving Africa. I felt deeply moved by what happens when people of diverse back grounds and skill come together under the guidance of a masterful and gutsy facilitator like Janet: unusual and powerful things happen. Join us for the next Pig Catching session on 25 August face to face or online at a later date (to be confirmed). This time our flying pig is: “How do I find time for meaningful deep work in the midst of the chaos of living and surviving?” Read more next week or in the quarterly Muse-letter – subscribe here. Next PostNext How do I find time for meaningful focused work in the midst of living and surviving?